Keeping up with performance standards is a must for the Department for Environmental Protection’s Environmental Response Team (ERT), as early last month the ERT conducted semi-annual training at the Kentucky National Guard’s Wendell H. Ford Training Center in Greenville, Kentucky. The training was to keep team members up-to-date for yearly U.S. Occupational Safety and Health Compliance (OSHA) standards and focused on responding to oil spills that occur with alarming frequency on both land and water in the oil-producing parts of the state. Mitigation, or lessening the effects of a hazardous waste spill, is only one topic covered during the four- day training session held at the training site . 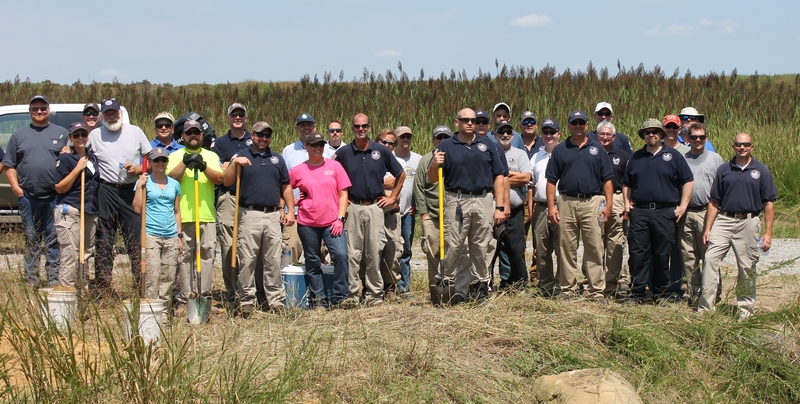 Team members became more familiar with boating laws and safety practices through classroom and hands-on field exercises as part of a collaborative training that involved the U.S. Environmental Protection Agency’s Environmental Response Team. Topics ranged from constructing simple containment devices to working with a command structure to handle larger and more complex spills. The ERT staff received training on how to build simple yet effective devices for containing oil in small streams. Team members constructed different dams and tested each one using water and floating oranges to simulate oil. Pictured above is an underflow dam built during the training as a simple, rapid-response device. The position of the pipes on the near side of the dam allows water to flow into the pipes under the floating oil while the discharge side of the pipes controls the depth of the water behind the dam. (Photo by Kevin Strohmeier). Other training focused on the science and the art of containment-boom deployment, which is the way most oil spills on inland waters are managed. ERT members learned how to place these non-absorbent floating barriers for collection, containment or exclusion of floating petroleum. The responders practiced anchoring the booms in such a way so as to allow for easy road access and removal but keeping the oil from moving past the barriers. Responders also honed their boating skills as they practiced towing booms through an obstacle course, which, in a real-life scenario, could be littered with trees, rocks and debris. The team practices proper boom deployment and anchoring while being monitored by trainers. “Each one of our responders can take what they learn here and oversee workers in their assigned areas as they deploy equipment during a real response,” said Francis. This picture demonstrates an improperly installed boom, which is one of the topics covered in the classroom setting. The installation pictured was improper due to the lack of easy road access that is needed to get vehicles to the site and pump out the oil. Due it the improper installation, the oil eventually leaked downstream and did much further damage than if the boom had been installed correctly. During the final day of training, the team put their skills into practice as they responded to an imaginary scenario in which several thousand gallons of petroleum had spilled from a nearby refinery. Some responders assumed roles of incident command positions, while others operated boats and pulled and anchored booms into position. Margie Williams, one of the ERT responders from the Paducah Regional Office, operates a small outboard motor as part of her boat operator’s certification. (Photo by Kevin Strohmeier).